﻿As a Health and Sport Social Worker I promote professional burnout and fatigue prevention through holistic support and strategies focused on three interrelated aspects of life: MIND, BODY, and WORK. Through my professional life working with a diverse population of clients, and my own personal life experiences, I have found that we are our best self when each of these areas are stimulated and cared for. To learn more, please explore my service offerings below. 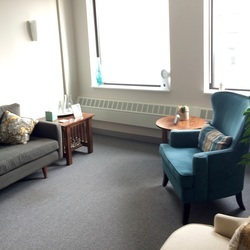 Using a caring, warm, holistic, and interactive approach informed by mindfulness and cognitive behavioral therapy Erin supports clients discover opportunities to shift from feeling stuck to moving forward. With the belief that people become their best self when there is a balance between the mind and body Erin offers services to support and encourage people to meet their health and fitness goals. ﻿From students to working professionals Erin supports those who are wanting to make strides in their professional life through individual consultation, workshops for groups of all sizes, and speaking engagements.